BuzzBuzzHome News has been documenting the progress of The Station Condos by Brandy Lane Homes since construction started in 2012. As we approach the “done” part of our series, we’re starting to see even more signs that the development is nearing completion. Residents continue to move into their new homes, and onsite crews are now working toward finishing the community’s landscaping. 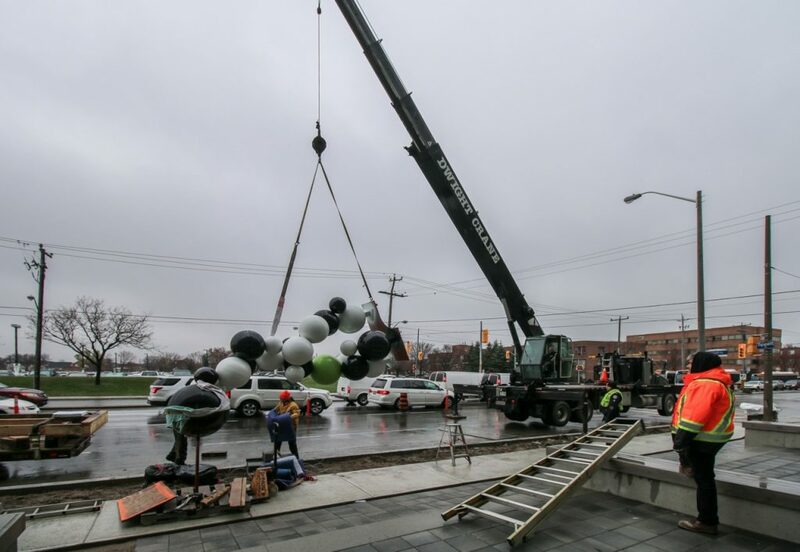 A focal point of the landscape plan is the public art that was chosen through a juried selection process and created by Toronto artist, Clare Scott-Taggart. We were fortunate enough to watch the final component of the overall sculpture being installed. Called Watson’s Dream, the sculpture was named after the scientist who first described the structure of DNA. The layers of inherent meaning allow Watson’s Dream to be appreciated on a number of levels. 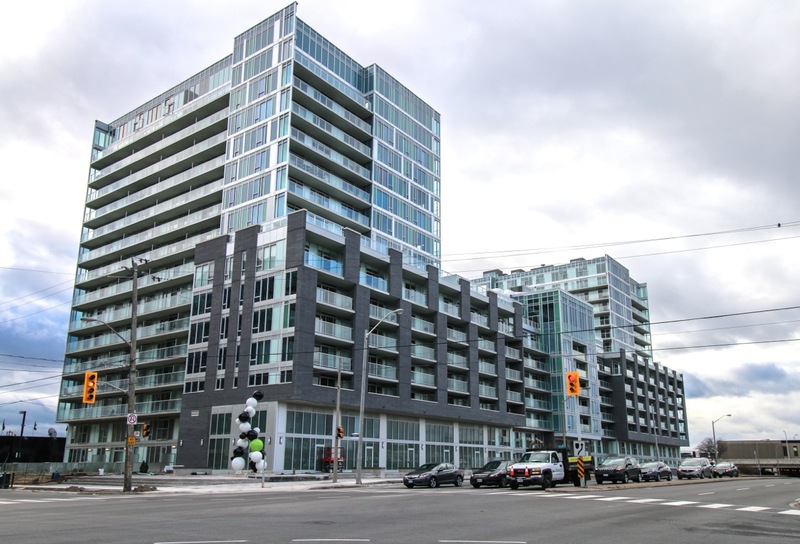 The premise is that Wilson Avenue, the Downsview neighbourhood, and The Station Condominiums are all about change. The area is undergoing a radical transformation that embraces the future of urban living. It is perfectly located to invent the quintessential modern urban life: a transit hub, a shopping Mecca, high density development, a wide welcoming avenue, and is steps to the biggest urban park in North America. 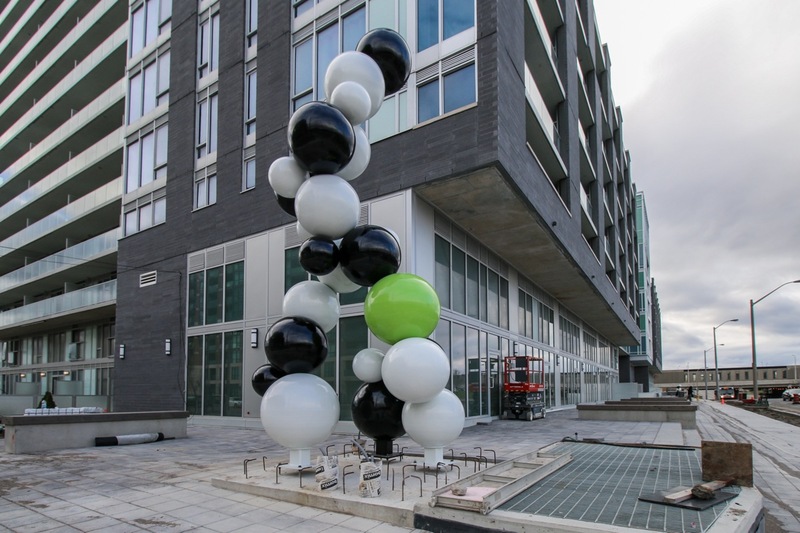 The 20-foot figure component consists of a highly magnified and stylized DNA molecule strand comprised of different sized stainless steel spheres. It embraces The Station’s convenient location, steps from the Wilson subway station, and encourages more pedestrian traffic along Wilson Avenue. It suggests energy in motion as well as denoting an abstract figure striding along the sidewalk toward the subway. The molecular balls represent the diverse group of people who live within the community. The second element, found on the wall on the western edge of the development, completes the sculpture and consists of three joined spheres and a series of half spheres mounted on the face of the wall. 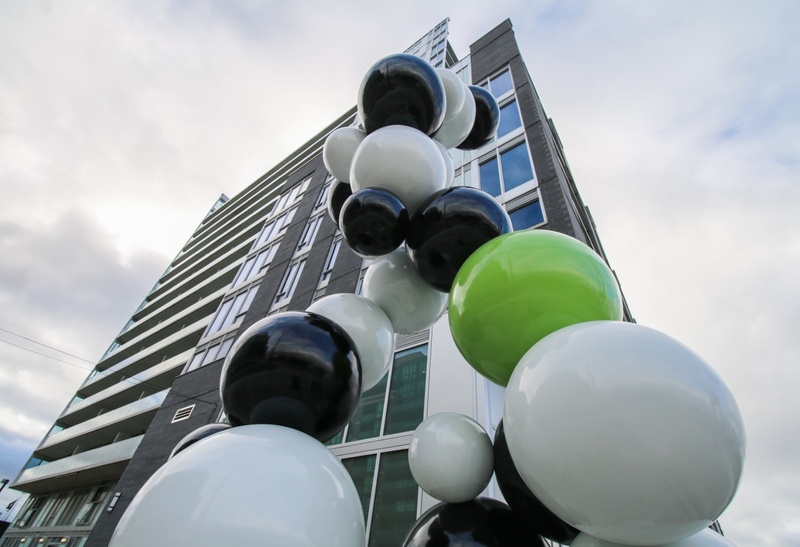 To see the public art for yourself, visit The Station Condos at 545 Wilson Avenue at Tippet Road, and be sure to register online. The sales centre and new model suite are located in suite 1103 East. Hours are Monday to Wednesday 12pm to 6pm and weekends from 12pm to 5pm. Closed Thursday and Friday. Just one 979-square-foot two-bedroom two-bathroom suite is still available at $466,900. The superb collection of penthouse suites featuring two-storey windows and grand rooftop terraces with incredible views ranging in size from 1,292 to 1,855 square feet, are priced from $664,900 to $884,900.